Oscar Wilde, (1854 -1900) now revered for his outlandish celebrity personality and brilliance as a novelist, essayist, dramatist and poet, did not begin his career with such fervent success. Wilde, born in Dublin Ireland, developed his intellectual interests from a young age as the son of a distinguished surgeon and writer. Wilde honed his intellectual skills at school, where he succeeded immensely in his studies of classics at Trinity College in Dublin and was awarded a prestigious scholarship to Oxford University in 1874 (Edwards par. 5). At Oxford, Wilde’s professor Walter Pater became his greatest influence. For Wilde and his contemporaries, Walter Pater’s conclusion to The Renaissance, became an essential source of guidance for aesthetes in their art and life; Pater argued that life should mirror the sensation and beauty of art. Upon completion of his education at Oxford, Wilde established himself as a celebrity spokesperson for Pater’s aesthetic principle “art for arts sake,” (Edwards par. 11). In 1881, Wilde published his first volume of poetry, Poems, with only moderate success. Despite Wilde’s lack of critical acclaim, he gained public popularity from his lecture tours in America and Britain, which allowed him to build his cultural influence before he published with greater success in the 1890s. Wilde reached his height of popularity in the mid 1890s with the publication of his comic plays, such as The Importance of Being Earnest. Wilde’s vocal expression of his non-traditional lifestyle led to increased criticism from his contemporaries, which led to his eventual downfall. During the 1890s, Wilde pursued a relationship with Lord Alfred Douglas and in 1895 Douglas’s father accused Wilde of being a “ponce and sodomite” (Edwards par. 21). Wilde fought this claim by suing him for libel, yet Wilde lost the case and was sentenced and convicted to prison for two years. Wilde’s popularity and influence waned because of his imprisonment and upon his release in 1897, Wilde lived in France in exiled ruin until his death in 1891. Despite Wilde’s tragic imprisonment and fall from the spotlight, he is now respected remembered for his literary genius and bold personality. Wilde’s first book of poetry, Poems, published in 1881 received moderate success. Wilde had previously published approximately forty poems in various Irish, American and British periodicals. Ian Small, the foremost critic on Wilde’s early poetry, asserts that Wilde’s apparent success in periodicals and self-proclaimed popularity led him to publish the volume. Poems’ initial print run consisted of 750 copies, but was released in three editions in 1881. Small affirms the three editions demonstrates the collection’s lack of success, since the second and third “editions” were remarketed from unsold copies of the first edition with the hope to increase sales. (xv). Small cites Wilde’s relative failure as the result of different markets for the periodical and volume audiences. Poems cost 10s, which was higher than the prices of the periodicals where had Wilde previously published and Small claims Poems, “seems to have been marketed at a more discriminating and wealthier market” (xii). As a result, Poems received predominantly negative reviews and critics denigrated Wilde for his “second-rate and derivative” poetry, apparent plagiarism, as well as his “unmanliness” and “vulgarity” (Small ix). However, in 1892, after the success of Wilde’s dramas and novel, Poems was re-issued by Bodley-Head in a limited edition of 220 signed and numbered copies, which sold out in a matter of days (Small xviii). Wilde’s subsequent decision to remarket his early poetry for a niche market illustrates his status as a celebrity figure in Victorian society, whose name held as much influence as his work. 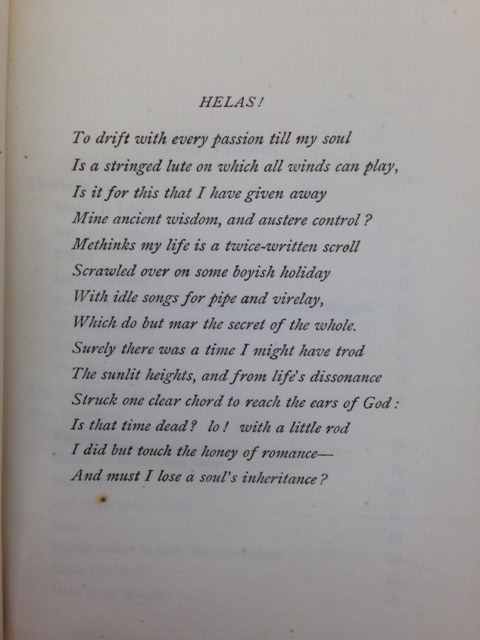 Wilde wrote “Hélas,” which means “Alas” in French, to be the epigraph for Poems. As the epigraph, “Hélas” guides the reader as a statement of aesthetic inspiration for the following poems. As an artistic movement, aestheticism prescribed the “separation of art from morality, maintaining that art need not be moral to have value” (Murfin 6). Thus, Hélas” presents the collection’s essential conflict between the desire for aesthetic self-realization through sensation and the ascetic expectations of Christianity. In this Petrarchan sonnet, the octave presents a passionate artistic soul who aligns himself with musical sensation of the lute and chooses to reject “wisdom and austere control” (4). The octave also expresses the speaker’s internal conflict between the artistic and austere self, since he describes himself as “twice-written scroll,” where idle and frivolous songs “mar the secret of the whole” (8). The sestet reveals the secret of the speaker’s conflicting pressure for religious austerity. It describes the musical beauties of God and heaven, proclaiming, “ Is that time dead? Lo! With a little rod/ I did but touch the honey of romance/ And must I loose a soul’s inheritance?” (12-14). These final lines reference the biblical story of Jonathan, in which Jonathan is sentenced to death for eating honey in direct disobedience of his father, Saul (Samuel 1.14:43). Critic James G. Nelson cites that Wilde’s final reference to Jonathan comes from Pater’s The Renaissance, in which Pater idolizes Jonathan as a saint of aestheticism, as Pater saw Jonathan’s decision to eat the honey as emblematic of the aesthetic desire for physical beauty and sensation (Nelson 130). To produce an aesthetic affect, the poem uses the extended metaphor of music and song to highlight the sensual, rather than sensible elements of poetry. However, Wilde’s attention to the aesthetic mars the accessibility of his poetry, since, as J.A. Cuddon claims, Victorian society saw aestheticism as a “vapid idealism…indeed to a kind of silliness”(Cuddon 13). It seems that Wilde’s literary success and popularity must be measured in tandem with his public visibility. Wilde embodied aesthetic ideologies both in art and lifestyle and after years of publicity, he became the foremost British aesthete of the 19th century. Therefore, Wilde’s poems only become famous and popular after his name and persona are known. Cuddon, J. A. The Penguin Dictionary of Literary Terms and Literary Theory. New York: Penuin, 1998. Print. Edwards, Owen Dudley. “Wilde, Oscar Fingal O’Flahertie Wills.” Oxford Dictionary of National Biography. Oxford University Press, 2004. Web. 21 Nov 2013. “The King James Version of the Bible.” Project Guttenberg. March 2011. Web. Nov 21 2013. Murfin, Ross and Supryia M. Ray. The Bedford Glossary of Critical and Literary Terms. Third Edition. New York: Bedford/St. Martins, 2009. Print. Nelson, James G. “The Honey of Romance: Oscar Wilde as a Poet and Novelist.” Redefining the Modern : Essays on Literature and Society in Honor of Joseph Wiesenfarth. Ed. William Baker and Ira B. Nadel. Madison: Fairleigh Dickinson UP, 2004. 130-147. Small, Ian. “Introduction.” The Complete Works of Oscar Wilde: Volume I Poems and Poems and Prose. Ed. Bobby Fong and Karl Beckson. Oxford: Oxford UP, 2000. ix-xxvi. Print. Wilde, Oscar. Poems. Third Edition. London: David Bougue, 1881. Print. “Virelay” is a short lyric poem originating from France during the 14th century. Samuel 1. 14:43 – Jonathan says, “I did but taste a little honey with the end of the rod that was in mine hand, and lo, I must die” (Small 293).